Folk covers of familiar songs. Reimagined version of folk songs. Folkfan since childhood, coverfan since my teens. In my other life, I teach. In summer, I staff folk festivals. Learn more. All coverfolk provided solely for sampling purposes, for a short time, to encourage people to buy music, directly from the artist wherever possible. Got questions? Contact me. Cover Lay Down is proudly ad-free, but music hosting isn't. Every coin in the busker's hat goes to bandwidth expenses. Thanks for your support! Tributes, Tradfolk, Covers Compilations & more! with The Ahern Brothers, Gina Clowes, Kyle Carey & more! A-sides, b-sides, deep cuts, one-shots and more! In February of 2013, Cover Lay Down's host went bankrupt, leaving us to reconstruct the blog from scratch. Happily, features from our first five years remain available thanks to the Wayback Machine Internet Archives, a non-profit working to preserve the web for posterity, and we are eternally grateful for their hard work. Check out the first five years of Cover Lay Down here! By definition, a great tribute album must hit the mark in both homage and realization, proving worth and worthiness of the original artist and his canon through song selection and composition, while still demonstrating the value and validity of reinterpretation through a well-arranged and well-performed tracklist. It’s a high standard, and in a lifetime of cover-chasing, we’ve seen less hits than misses, more also-rans than outright successes. But a rarified few aim higher still. Keeping to the same genre or subgenre narrows the parameters further, offering a particular challenge to those who could easily drift towards mere reproduction. Adding in other rules – using only independent artists, for example – makes for even higher walls, with even greater possibility of faltering. By the time we consider the possibility of the track-by-track album tribute, we find ourselves on the razor’s edge of daring: few albums attempt such a fine focus, and of those few that have tried in the past, many fall flat on one count or another. By this standard, Long May You Run, J. Tillman Revisited, Slowcoustic’s emergent homage to Tillman’s oddly titled seminal sophomore solo album, is a triumph of curation and performance: appropriately imperfect, definitively Tillman, and shockingly diverse. The songs it contains yaw through an unexpectedly broad gamut, given their inheritance, but all are worth keeping, and a surprising number are startlingly beautiful and broken. And today, we are pleased and honored to bring you not one, but three exclusive cuts from this potent collection as part of a gradual-release experiment orchestrated by Slowcoustic host and project curator Sandy, aka Smansmith. That Tillman’s album shaped Sandy’s own sensibility at “the unhurried side of Americana/Alt-Country/Folk/Indie/Down-Tempo music” is inherent in the project’s genesis; though there is an interesting diversity of interpretation here, unsurprisingly, as with the original, the mix here is almost universally lo-fi, and often quite raw; those looking for sweetly melodic, high-harmony singer-songwriter fare are missing the point. But there are more things in heaven and earth than sweetness and light, both in and beyond the boundaries of emotional depth and qualitative excellence which the Revisited project embody. For one thing, there is more here than one might expect from an album paying tribute to a small 11-track original. The lack of physical media limitations in the digital age have brought us an increasing number of full-album tributes that go beyond the track-by-track boundaries of the original album, and Long May You Run, Revisited is no exception: there are 20 tracks here, with as much as three versions of some songs, making it possible to compare versions, or mix-and-match to make the ideal mix depending on the listener’s mood – and making the album that much more open-ended, which also, in its own way, reflects the open-ended fragility of the solo singer-songwriter approach which J. Tillman took in this early release. The second-hand title of the original album begs for coverage in ways too obvious to mention, of course. Even the slow-leak incidence of the homage pays fitting tribute to its origins, in that like the original, which was originally recorded in a borrowed basement in the dead of winter, and released in a tiny run of 150 in 2006, the tribute is finding its way into the world in small bursts. Our own effort herein, then, becomes like one of the multiple spaces in which Tillman wrote his songs – a compliment to the several features which Slowcoustic has shared over the last several days, and will continue to mete out for the remainder of the week, until we find ourselves fully able to appreciate that rarest of tribute albums: that which lasts, and stands on its own as both tribute and celebration. Today, then, we offer a trio of tracks which, up until now, have been heard by none save the artists, and by Smansmith himself: two which complete the first pass at the full eleven tracks on the original, and a second cover of Trouble’s Always Free, which – in that it is more rugged, and more lonely, than the Small Sur version of the same song that Slowcoustic shared yesterday in Part III of the ongoing release – seems a perfect pairing for the quiet, almost demo-quality gems from underground iconoclastic Lexington, KY-based singer, songwriter, and multi-instrumentalist Doc Feldman and Cover Lay Down fave and Yer Bird recording artists Pickering Pick. All three share much in common: male voices, sparse setting, and subdued, almost heroin sentiment. But each is beautiful, proving the viability and value in the project overall. Check out the tracks below, head back to Slowcoustic to read and collect more from the project, and then keep an eye on that space over the next few days as the remaining tracks hit the web. Our bonus tracks today come from outside the J. Tillman catalog, where we find his own 2010 full-album tribute to the formative influencer who shares credit for the original album title of both tribute and original above. 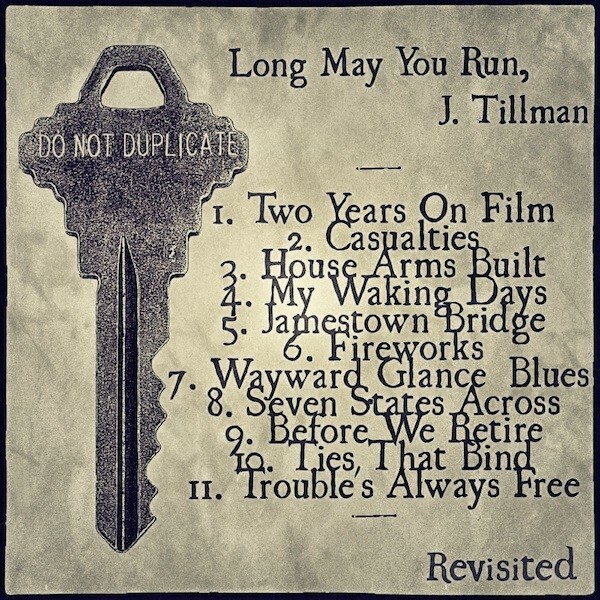 Like today’s feature, Tillman Sings ‘Tonight’s The Night’ hits the mark; pick it up, and listen alongside Long May You Run, J Tillman Revisited to close the loop of coverage and blog-born tributaries.